January 28, 2016, 3:34 PM · Members of a youth orchestra, playing in the Superbowl Halftime Show? Yes! This year's Super Bowl 50 halftime show on Feb. 7 will include conductor Gustavo Dudamel leading students from Youth Orchestra Los Angeles (YOLA) -- the El Sistema-inspired youth orchestra that was formed in 2007, shortly after Dudamel was named music director of the Los Angeles Philharmonic. 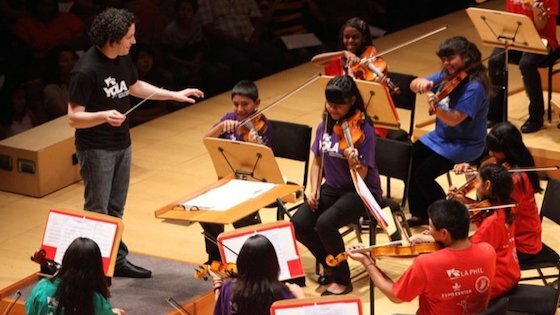 Gustavo Dudamel conducts Youth Orchestra Los Angeles (YOLA). Photo courtesy of the LA Phil. Of course, I'll be rooting for the YOLA kids (and for my hometown Denver Broncos, who will play the Carolina Panthers in the NFL's championship game) -- though it's possible that others will be paying more attention to the pop-music superstars lined up for this gig: Coldplay, Beyoncé and Bruno Mars. The game takes place at Levi's Stadium in Santa Clara, Calif., near San Francisco. Regardless, what a wonderful opportunity to showcase the importance of music education and orchestra programs in the United States. YOLA has programs in three locations in Los Angeles, serving a total of 700 students, ages 6-18, from underserved neighborhoods. The group performing in the Super Bowl is from the South L.A. "Expo" site, which is also supported by the Harmony Project and the Expo Center. The Los Angeles Philharmonic and other partners provide free instruments, intensive music training, and academic support to the students. Dudamel himself is a product of Venezuela’s "El Sistema," a state-supported system of music education. Dudamel also is in his 17th season as Music Director of the entire El Sistema project in Venezuela, where he continues to lead the Simón Bolívar Symphony Orchestra in Venezuela as well as on tour.